Another 87 miles completed. Tomorrow we head for our fourth compass point, and final destination, Dunnet Head. It hardly seems possible that two weeks ago we started out at Lizard Point. Beauly (a lovely little Highland town) was grey, overcast and cool this morning. I again had connectivity issues in getting my blog despatched. By the time that was sorted and I was ready to go, everyone else had set off. Nick, Stefano and John waited back for me and we rode the day out together. The first ten miles across the Black Isle to Dingwall was straightforward and pretty fast. 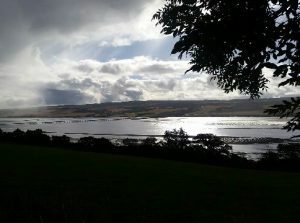 Sustrans Route 1 then takes you off high above the A9 offering stunning views of the Cromarty Firth. After an initial downpour we were seeing the Firth at its best in the weak but bright sunshine. The road drops back down to Alness, and goes via Dalmore and Invergordon. For quite a few miles you actually track the shoreline. Our first food stop was at Tain, a Royal Burgh and beautiful town. There we caught up with everyone else. Another Life Cycle touchpoint, on the first Life Cycle, going the other way, we ate at the Old Bakery in Tain. We all then spent the rest of the day on the A9, because you have to. Quite quickly after Tain you cross Dornoch Firth, again to expansive panoramas in all directions. Dornoch is actually home to one of the great British links courses, seemingly more demanding than most that host the British Open. The only factor which prevents it hosting is its remoteness. When I have a little more time on my hands, it is top of my bucket list to play. 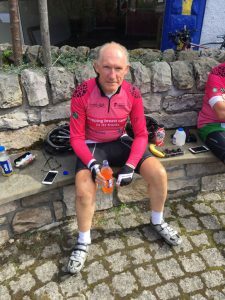 On we went tracking the coastline through Golspie to Brora, where we stopped to pick up cold drinks and snacks from the Co-op, to enjoy in the warm sunshine sitting on a concrete bench around a memorial to Queen Victoria. It was lovely. Whilst there, six motorcyclists roared up, stopped and one jabbed his finger and shouted at us ‘Get back on those…..bikes and get the job done’. 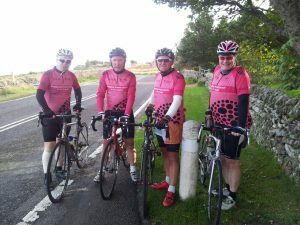 I’m thinking there’s six of them and four of us, they look like big guys, they are on motor bikes, we are on push bikes…….It turns out the lead cyclist was a friend of Nick’s and they were riding the North Coast 500 this weekend. Next stop Helmsdale, which was our first stopover point on Life Cycle 1. Again we saw all the others, but they were just leaving as we were arriving. Karen directed us to the Thyme and Plaice, a homely establishment with great food, and a number of (pedal) cyclists doing the North Coast 500. There were only 19 miles left to do from Helmsdale. But, what a 19 miles. Shortly after you leave the town there is a three mile steady ascent, a long tough climb inland followed by a long fast descent to the coast. Then there is another tough climb and a sign announces the Berriedale Braes. These are legendary with end to enders. 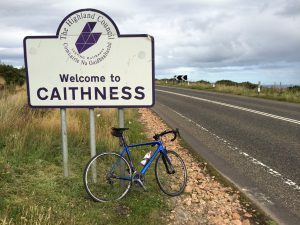 If you start at John O’Groats, you hit them very early before you have much in your legs; if your start is from Land’s End, you have too much in your legs when you get there. We had more 1,250 miles in ours. The initial descent from the south is 13%, very straight and very fast, for over two miles. Even the experienced riders thought this a big one. At the bottom it turns abruptly uphill and you are confronted by a series of very sharp and very steep switchbacks, which actually kick on the turns. It is a brutal ascent. Everything slows up, trucks, caravans, motor cyclists and pedal cyclists. And the tightness of the bends on the switchbacks results in heavy vehicles negotiating their path both ways jockeying for scarce space. It is a lung bursting test (well it was for me at least). We had a few close shaves. After Berriedale, there are further ups and downs, but it was a gradual descent to our overnight accommodation. We all made it to the Craiglea Guest House in Latheronwheel, a hamlet beyond Dunbeath. 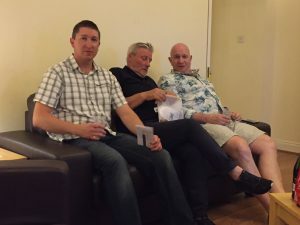 It is essentially a very well appointed self-catering complex of bedrooms and residential facilities, including a swimming pool which a number of riders took advantage of (involuntarily on Stefano’s part). It was a long day, with too many miles on the A9, but we were still all in before 1800. After initial rain the weather had been kind to us. I don’t think I have ever passed so many distilleries on a single day, and without visiting any. Time is too tight! Our Life Cycle Miles today were in honour of Ros Elphick (nominated by Sue Stannard); Rick Martin-Bacon (nominated by Cheri Ambrose); and Sally Chapple (nominated by Emma Oldham). All of their stories are set out on the Life Cycle Miles site. Recently I was moved in listening first hand to Sally’s story. Like so many others it is a powerful motivator to try and do something which might help make a difference. And the entire team genuinely believe they are doing just that. The managers of our facility prepared an excellent meal for us this evening. The team are in good spirits, with many in a pensive mood as they reflect on what they have done over this past two weeks. There is a great sense of anticipation for tomorrow. Our 87 miles today takes us to 1,275 completed, with one more leg to go. 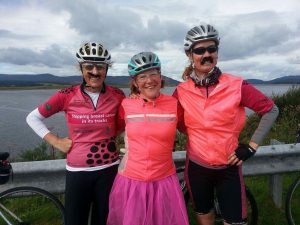 So, the tutu and moustaches look mighty fine! Makes my thesaurus find of ‘groovy’ (in relation to ‘Outstanding’- have changed thesaurus) seem more apt than I first thought. Congratulations on making it through the penultimate day, distillery denying and all. A leisurely return to Dornoch (the sandy beaches are amazing) seems very well-deserved. Strange to think that as the comments collect, you are all clocking up your final miles in your admirable quest to make a difference. It is a staggering achievement. I look forward to the final instalment when WiFi permits and hope you all have a truly wonderful evening. Must be downhill all the way by now! If you are interested it is a similar distance to the largest sand dune in Europe and back (just south of Bordeaux). When driving there with the family this summer though from time to time about you all cycling a similar distance. Amazing achievement. I will put my hand in my pocket! Best. R.
You have my utmost admiration for your resilience and determined effort- fantastic achievement. The Life Cycle series demonstrates the amazing collaboration between Uni of Nottingham and the Medical School, with medical research and patients benefitting directly. Your blog (and todays pics) should be compulsory reading for all students and staff so we can all begin to appreciate and be inspired by the sacrifices made by our most senior staff. As a GP (and Associate Professor at the Medical School) I have definitely had my fingers crossed each evening whether hips and musculo skeletal systems hold up. Enjoy a proper well-earned rest after. Utterly honoured to have people like you guys on my and fellow sufferers’ side. Cancer is a lonely journey at times and despite the incredibly high standard of clinical support we receive the boost to morale in knowing that people are willing to go above and beyond the call of duty is astounding. Keep safe and enjoy the ride.